A colour photograph of a red brick house in the Miniature Village at Cullen Gardens. This building is a replica of the Hambly House at the corner of Highway 27 and King Road in Nobleton, Ontario. 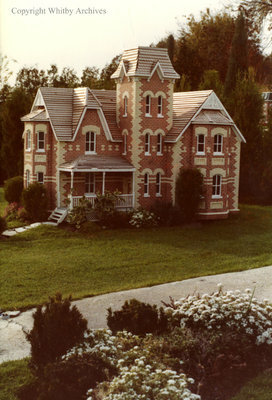 Red Brick Residence in the Miniature Village, Date Unknown, Photographer Unknown. Whitby Archives A2013_042_196.